Peter Basso Associates is an MEP consulting firm that can be counted on for leadership and foresight in industrial engineering solutions. Our MEP design engineers develop long term solutions in the near term with conceptual planning where value is added and costs can be reduced. Mechanical design services go far beyond traditional HVAC and plant systems design to include geothermal heat exchange, regenerative heat of compression compressed air systems, process industrial heating /cooling systems, and industrial energy recovery systems engineering. Electrical engineering design professionals can help your team by providing design services information regarding reliability, redundancy studies, point of failure analysis, power quality analysis, capacity, and load demand analysis. Plumbing design professionals provide standard services to support domestic water, process water, sanitary systems and storm drainage, but can also add value helping focus on green technologies through water conservation, gray water systems, and pure water systems. With an experienced team of professionals, PBA offers years of proven success with retro-commissioning and renovation of existing industrial facilities. We strive to reach the highest standards of efficiency and have LEED® Accredited Professionals on our team with the expertise to help you retro-commission an existing space for improved energy efficiency that can significantly lower monthly energy costs. Peter Basso Associates commitment to MEP design excellence is integrated into our process. By evaluating multiple design alternatives in collaboration with our customers, we can weigh capital costs, make expert recommendations that add value and optimize budgets and schedules. Our dedicated engineering professionals use state-of-the-art technologies to ensure quality is never compromised during any stage of design, construction, and your facility lifecycle operations. PBA is a leader in using cutting-edge technology to improve our project outcomes. Our expertise in building information modeling (BIM) and 3D modeling streamlines our design services for high-quality mechanical, electrical and plumbing systems. Our experienced, service-oriented design teams assure all systems and equipment perform to design specifications. Peter Basso Associates’ MEP design engineers provided MEP design services for the complete renovation of Gage Products’ Building 821 in Ferndale, Michigan. The renovation included approximately 3,150 sq.ft. of new solvent/fuel lab space and 2,700 sq.ft. of office space. PBA provided MEP engineering design services to aluminum wheel manufacturer, Dicastal North America, for its $140 million manufacturing investment in Greenville, MI. 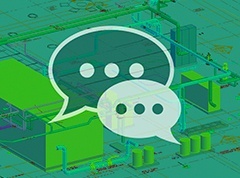 Stay up to date on MEP engineering trends and industry news.